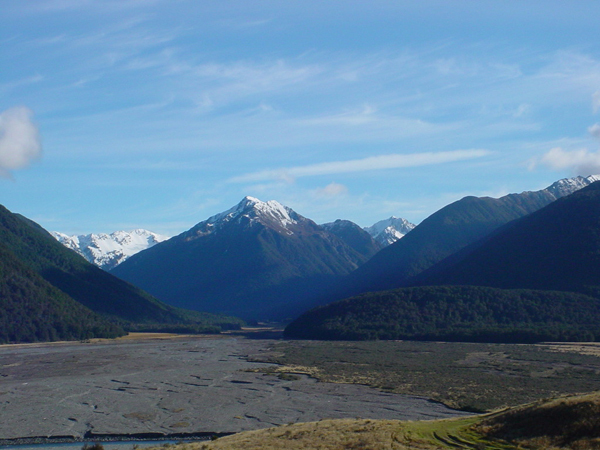 We had a frustrating day in the Hawdon Valley on Sunday 14th March as part of a Canterbury OSNZ weekend at Arthur's Pass. The other folk on the trip had perhaps an even more frustrating day on the Saturday [13th] with a fruitless search up the Otira Valley for Rock Wren. We all met up at the shelter at the end of the road before 9am,with our guide for the day John Kearvell, and his wife Mabel. John has worked on Orange-fronted Parakeets for many many years and is an acknowledged expert in finding them. The bad news was that the birds had seemingly run out of food. A couple of months previously they had been breeding non-stop for over a year. Now they are quiet, and there may be many fewer in the valley - some possibly having left to find some tucker. The birds in the nearby Poulter Valley are still breeding, there being some beech seed still around there - but those birds are a 6-hour tramp in. The birds were doing what they normally do when not breeding in autumn - following flocks of Brown Creepers (with sometimes other species mixed in). The problem initially was finding the Brown Creepers. We were shown a nest hole used just a few months before, right next to the main track on the true right of the Hawdon River. The sheets of tin and a local profusion of traps give nesting trees away. Eventually we got onto a Brown Creeper flock, after transferring from the main track (actually the A trap-line) to the next trap line at the base of the slope - the B trap line. After getting onto a couple of parakeets, the disappointment was they were only Yellow-crowns. We walked the B line to Unknown Stream, which was a little on the dessicated side, before lunch. Encountering another couple of Brown Creeper flocks on the way, and 3 of the team getting stung by wasps after one of us stepped on a wasp nest when venturing off-track. After lunch an hour or so was spent on the other side of Unknown Stream looking for a lone male Yellowhead which lives there in the area between lines B and C. In spring it sings its heart out apparently and is easy to find. In autumn and winter it ranges through the red beech there with Brown Creepers - but we found neither, nor any OFPs. We headed back out of the valley along the B line listening for Brown Creepers. Eventually a large flock was found and followed on track by most, off track by John, who was joined by Sue. A shout goes up and John and Sue, who were walking back to the track having given up, had got incredible views of an OFP. The problem was joining them as the group scrambled over fallen trees brushing aside bush-lawyer. By the time we got there the birds had, naturally, scarpered and blended into the greenery. Thus reluctantly we followed the B line further down the valley. The Brown Creeper flock being ahead - and probably parakeets with it. Another 10 minutes and either the same birds, or maybe others were seen from the track, 3/4 of the way up a mountain beech. Some saw the orange stripe of one bird - most had to be content (me included) with seeing the bird, but not its most distinctive feature. Oh well, there's always another time - preferably when they are breeding and a nest can be watched.